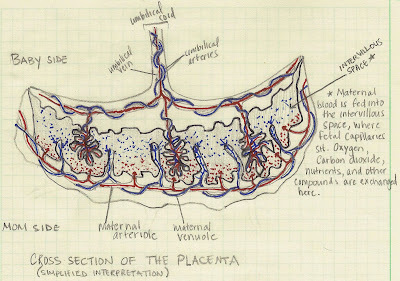 Double X Science: Pregnancy 101: My placenta looked like meatloaf, but I wasn’t about to eat it. 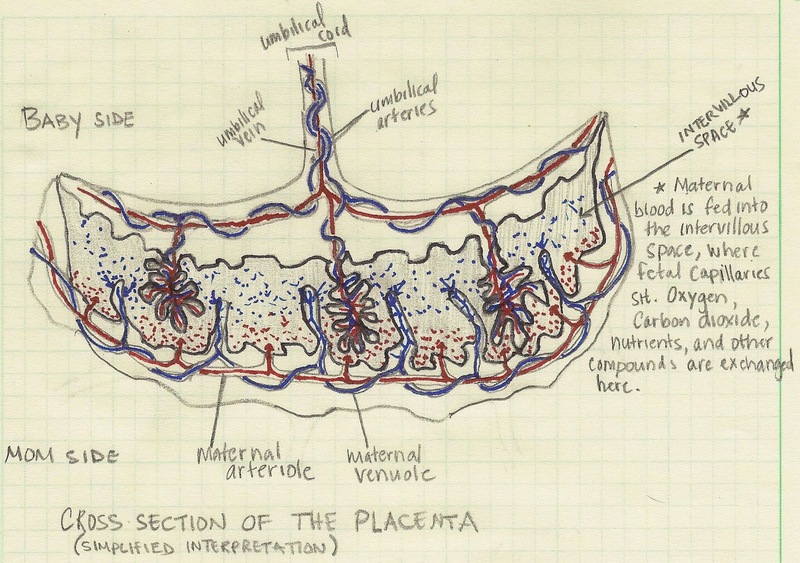 Pregnancy 101: My placenta looked like meatloaf, but I wasn’t about to eat it. 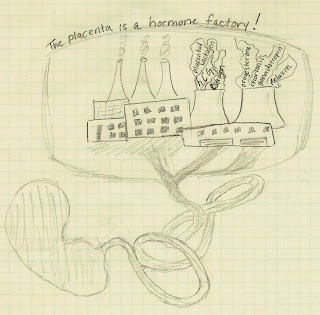 An historic view interpretation of the placenta (source). She gave me a few minutes to meet my daughter before she reeled me back into a state that was my new reality. “You’re not finished Jeanne. You still need to birth your placenta.” What?!?! More pushing? But I was lucky and the efforts required to bring my placenta ex vivo were minimal. The idea of a placenta, which is the only human organ to completely and temporarily develop after birth, was fascinating. That thing sitting in a rectangular periwinkle bucket was what allowed me to grow another human.. inside of my body! There was no way I was not going to check it out, as well as create a permanent record of its relatively short-lived existence. My first impression was that it looked like “meatloaf.” Not necessarily a well made meatloaf, but perhaps one that is made by my mother (sorry mom). But, alas, chaos reigned and I wasn’t able to really take a good look. However, for my second birth and hence second placenta, my midwife indulged me with a more detailed look and a mini-lesson. Where geekling deux spent 39 weeks and 4 days. Her gloved hands, still wet with my blood and amniotic fluid, slid into the opening that was artificially created with a tool resembling a crocheting needle. She opened the amniotic sac wide so I could get a baby's eye view of the crimson organ that served as a nutritional trading post between me and my new bundle of joy. 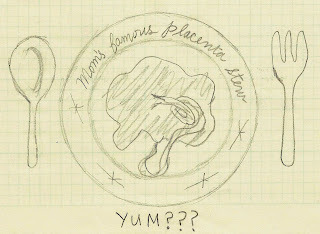 She explained that the word “placenta” comes from from the Greek word plakoeis, which translates to “flat cake” (however, I’m sure if my mom’s meatloaf was more common in ancient Greece, the placenta would be named differently). “It’s one of the defining features of being a mammal,” she explained as I was working on another mammalian trait – getting my baby to nurse for the first time. That was about all I could mentally digest at the time, but still, more than three years later, the placenta continues to fascinate me, mostly due to the fact that it is responsible for growing new life. It’s a natural topic for this long overdue Pregnancy101 post, so let’s dive in! It all starts when a fertilized egg implants itself into the wall of the uterus. 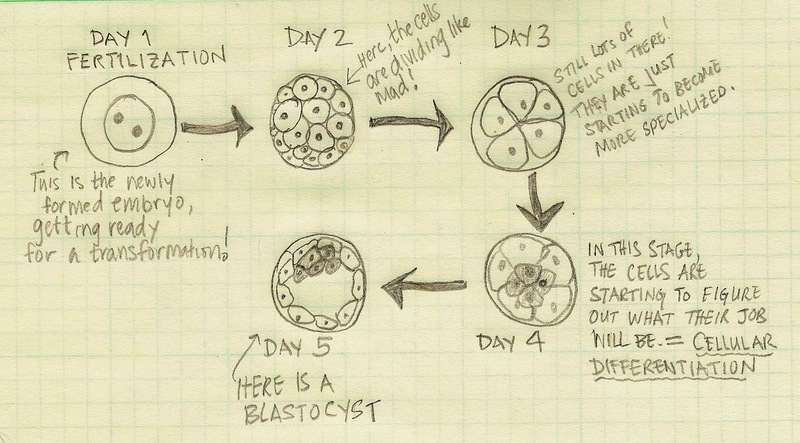 But, in order to fully understand how it works, we should start with an overview of the newly formed embryo. The very early stages of us (and many other things that are alive). leading to implantation of the blastocyst. As soon as a male sperm cell fuses with a female egg cell, fertilization occurs and the cells begin to multiply. But, they remain contained within a tiny sphere. As the cells continue to divide, they are given precise instructions depending on their location within that sphere, and begin to transform into specific cell types. This process, which is called cellular differentiation, actually seals the fate every cell in our body, sort of like how we all have different jobs – some of us are transport things, some of us are involved in policing the neighborhoods, some of us build structures, some of us communicate information, some of us deal with food, some of us get rid of waste, etc. Every cell gets a job (it’s the only example of 100% employment rates!). Now back to the cells in the fertilized egg. As they start to learn what their specific job will be, the cells within the sphere will start to organize themselves. 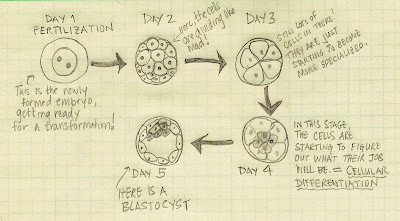 After about 5 days after fertilization, the sphere of cells becomes something called a blastocyst, which readies itself for implantation into the wall of the uterus. Eventually the trophoblast becomes the recognizable organ that is the placenta. Consider the “flat cake” analogy, with the top of the cake being the fetal side (the side that is in contact with the baby), and the bottom of the cake being the maternal side (the side that is in contact with the mother). of maternal blood, which is constantly replenished my maternal arteries and veins. The red represents oxygenated blood, and the blue represents de-oxygenated blood. Projecting from the center of the fetal side of the placenta are two arteries and one vein, coiled together in a long, rubbery rope, often bluish-grey in color. This umbilical cord serves as the tunnel through which nutrients and waste are shuttled, and essentially serves to plug the baby into the mother’s metabolic processes. At the umbilical cord-placenta nexus, the umbilical cord arteries and vein branch out into a network of blood vessels, which further divide into a tree-like mass of vessels within the placenta. These tree-like masses originating from the umbilical cord (and thus fetus) sit in a cavity called the intervillous space, and are bathed in nutrient-rich maternal blood. This maternal blood, which provides the fetus with a means for both nutrient delivery and waste elimination, is continually replenished via a network of maternal arteries and veins that feed into the intervillous space. Furthermore, these arteries and veins help to anchor the placenta into the uterine wall. One of the most interesting aspects about the mother-feus relationship is that the blood vessel connection is indirect. This helps to prevent a detrimental immune response, which could lead to immunological rejection of the fetus (sort of like how a transplanted organ can become rejected by the recipient). Just like a plant needs sunlight, oxygen, and water to grow, a baby needs all sorts of nutrients to develop. And since a baby also produces waste, by nature of it being alive and all, there is an absolute requirement for waste removal. However, because we can’t just give a developing fetus food or a bottle, nor are we able to change diapers in utero, the onus lies completely on the biological mother. This is where the placenta comes in. Because the fetus is plugged into the circulatory system of the mother via the umbilical cord and placenta, the fetus is provided with necessary nutrients and a mechanism to get rid of all the byproducts of metabolism. Essentially, the placenta acts as a waitress of sorts – providing the food, and cleaning it all up when the fetus is done eating. But it’s not just about nutrition and waste. The placenta also serves as a hormone factory, making and secreting biological chemicals to help sustain the pregnancy. I mentioned above that the placenta produces hCG, which pretty much serves as a master regulator for pregnancy in that it helps control the production of maternally produced hormones, estrogen and progesterone. It also helps to suppress the mother’s immunological response to the placenta (along with other factors), which cloaks the growing baby, thereby hiding it from being viewed as a “foreign” invader (like a virus or bacteria). Despite the fact that the mother's circulatory system remains separate from the baby's circulatory system, there are a clear mixing of metabolic products (nutrients, waste, hormones, etc). In essence, if it is in mom's blood stream, it will very likely pass into baby's blood stream. This is the very reason that pregnant mothers are strongly advised to stay away from cigarettes, drugs, alcohol, and other toxic chemicals, all of which can easily pass through the placental barrier lying between mother and fetus. When moms do not heed this warning, the consequences can be devastating to the developing fetus, potentially leading to birth defects or even miscarriage. There are also situations that could compromise the functions of the placenta – restriction of blood supply, loss of placental tissue, muted placental growth, just to name a few – reducing the chances of getting and/or staying pregnant. This placental insufficiency is generally accompanied by slow growth of the uterus, low rate of weight gain, and most importantly, reduced fetal growth. And it’s not just the growth of the placenta that is important – where the placenta attaches to the uterus is also very important. When the placenta grows on top of the opening of the birth canal, the chances for a normal, vaginal birth are obliterated. This condition, known as placenta previa, is actually quite dangerous and can cuase severe bleeding in the third trimester. 0.5% of all women experience this, and it is one of the true medical conditions that absolutely requires a C-section. Then, there is the issue of attachment. If the placenta doesn’t attach well to the uterus, it could end up peeling away from the uterine wall, which can cause vaginal bleeding, as well as deprive the baby from nutrient delivery and waste disposal. This abruption of the placenta is complicated by the use of drugs, smoking, blood clotting disorders, high blood pressure, or if the mother has diabetes or a history of placental abruption. Conversely, there are times when the blood vessels originating from the placenta implant too deeply into the uterus, which can lead to a placenta accreta. If this occurs, the mother generally delivers via C-section, followed by a complete hysterectomy. There are many instances where the placenta plays a huge role in the culture of a society. For instance, both the Maori people of New Zealand and the Navajo people of Southwestern US will bury the placenta. There is also some folklore associated with the placenta, and several societies believe that it is alive, pehaps serving as a friend for the baby. But the tradition that seems to be making it’s way into the granola culture of the US is one that can be traced back to traditional Chinese practices: eating the placenta. Placentophagy, or eating one’s own placenta, is very common among a variety of mammalian species. Biologically speaking, it is thought that animals that eat their own placenta do so to hide fresh births from predators, thereby increasing the chances of their babies’ survival. Others have suggested that eating the nutrient-rich placenta helps mothers to recover after giving birth. However, these days, a growing number of new mothers are opting to ingest that which left their own body (likely) through their own vaginas. And they are doing so though a very expensive process involving dehydrating and encapsulating placental tissue. Why would one go through this process? The claims are that placentophagy will help ward of post partum depression, increase the supply of milk in a lactating mother, and even slow down the ageing process. But, alas, these are some pretty bold claims that are substantiated only by anecdata, and not actual science (see this). So, even though my placentas looked like meatloaf, there was no way I was eating them. If you are considering this, I’d approach the issue with great skepticism. There are many a people who will take advantage of maternal vulnerabilities in the name of cold hard cash. And, always remember, if the claims sound to good to be true, they probably are! Thanks for tuning into this issue of Pregnancy101, and enjoy this hat, and a video! Awesome post, Jeanne. 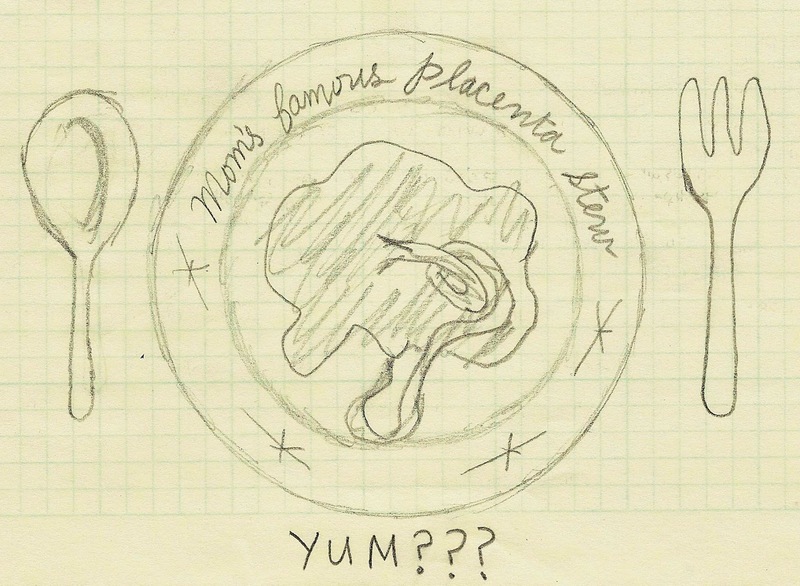 I love the placenta, but I had no interest in eating my own. One of the things that I find most interesting about the placenta is how much variation there is between animal species in microscopic structure. Some species - ruminants, pigs, horses - have a full 2 intact epithelial membranes separating mom and baby's blood. In these species, fewer nutrients and immunoglobulins cross the placenta, so their young are born pretty lean and really need colostrum fast to get their immune systems going. We humans have a much more intimate placental structure, and nutrients and immunoglobulins (as well as more unsavory compounds, as you mention) pass easily from mom to baby. Great article, but it's not correct to say the placenta is the only organ to completely form after birth, as it's made entirely of the baby's cells, and therefore forms before birth.